No more opening match against Carlton at Ikon Park? No worries; off to Geelong we go! We arrived early and there were already substantial queues forming at the gate. A healthy mix of Collingwood, Geelong, and AFLW fans waiting with anticipation stood before us. We ended up chatting with some lovely Collingwood fans about any such thing. The wait was soon over as we found good seats and tucked into the fried goodness of game day fare. Families, friends, and staff all waited jovially with ice creams, drinks, and food while watching both teams go through kicking drills. Collingwood and Geelong were showing us fine examples of the talent each and everyone of them possessed and why they had a spot on an AFLW list. History was about to be made. Those of us supporting the pies welcomed them with a resounding roar as they ran through the banner “UNLEASH THE PASSION” for this historic opening match. Soon our attention shifted when an even bigger roar and some fire cannons welcomed the Cats girls onto the ground for their first game. Nice pyrotechnics Geelong; maybe Collingwood could get some meat and fruit pie cannons? Not the worst idea I’ve had. Both teams game out with their game faces on as we paid tribute to the Indigenous of our land and the national anthem was sung. The screen zoomed in on the captains, with Steph Chocci winning the toss and Collingwood kicking towards the city end. The siren blared and it was time. Time for these girls to shine. Immediately you could see the skill level had improved exponentially since the last season. These girls are quick and have super defensive sides. They know what they want and they were here to get it. Credit to Ash Brazill; she played a phenomenal game. Quickly the ball made its way down to the City end and a behind was scored for the B&W by Jaimee Lambert. This was followed up quickly by a new historic opening goal; this time by Sophie Alexander. Six minutes later and a behind was added to the Collingwood score. Alexander went for a goal again 48 seconds later; this was amazing stuff. Collingwood were quick and had the ball where it needed to be. The Cats were putting up a damn good fight as well. The overtime of this quarter welcomed Geelong to the scoreboard; with a goal from Maddy Boyd and Renee Garing kicking a behind. We ended the quarter beaming from ear to ear; footy is back! The second quarter soon got underway with nearly nine minutes of it being a purely defensive affair. Geelong were outrunning Collingwood and Nina Morrison was showing exactly why she was the number one draft pick. She has speed and is able to get the ball when you wouldn’t think you could. Collingwood started to slow down and Mia Clifford of the Cats got an absolutely fantastic goal (even if I do say so myself). The defensive affair remained for the rest of the quarter; as Maddie Boyd increased the cats lead to 11 with a snag towards the end. A half time interval was presented with some awesome little kids playing Auskick; the whole audience had even warmer hearts after watching; and some intensive speeches happening within the two respective clubs. Once we had said farewell to the Auskick kids; it was again game time and Collingwood were out for blood. Within a very short time frame; the game was halted as Sophie Alexander copped an accidental knock to the head. Our hearts sank as we watched the events unfold and the Collingwood girls with extremely concerned looks on their faces as she was stretchered out. The absolutely amazing Cecilia McIntosh showed her winning personality as she checked on Sophie before the paramedics took her away. This signalled to Collingwood that the fight had to be faster and dirtier; beginning right now. The legend that is Sarah D’Arcy quickly pocketed a goal. The lead was back within five points. A rushed behind came the Pies way; with the gap reduced to four. My heart began to break as Lambert went down with an ankle; yet warmed again as she quickly returned to the field and got a goal during the overtime of the quarter. The overtime continued with Kristy Lambert getting a behind; then Orr, then Clifford. 1 Point remained the difference and the siren sounded to signify the end of the nail biting quarter! So you thought quarter 3 was nail biting Kate? What about quarter 4? Oh my goodness. Less than three minutes in, Jordan Ivey for the Cats got a behind to level the scores. By this stage; everyone watching was screaming and passionately directing the game. There were to be no misses; this game was here to be won. Like most of the game; Stratton, Brazill, and Bonnici were giving fantastic performances to the end. Every single one of the girls on the field were amazing. It was in the dying moments of the game that the number 1 draft pick went for a quick goal; getting a behind. This put Geelong in front with very little time left. I can say everyone going for Collingwood had an increased heart rate at that moment. Fantastic defensive work from both sides. Whilst Collingwood did manage to get it down their goal end (several times); the new kids on the block dominated with their game play. The final siren blared and the Geelong team had emerged triumphant winners. A loud roar went up and the Geelong theme began to play loudly and repeatedly. With the game over, my dad was still in awe at everything he saw and was excitedly chatting about all the talent he witnessed. We made our way back to the car with nothing but love for the fantastic Pies’ girls and respect to the Cats. Listen up for future; Geelong have a lethal back line. A leisurely drive back to Melbourne and we were still talking about the game and players once we got home. The day was over; however; how could anyone not smile? AFLW was back and history yet again made. It was a cracking game to watch with so many twists and turns at every opportunity. Thank you to Geelong for hosting us and providing the venue. A great time was had by all. Until next week, back to liking Cats and eagerly anticipating the game against Melbourne! Lover of family, friends, food, fun, my pets, AFL, AFLW, crafts and many other things. Qualified Sociologist, Driver, and Office Professional. Always covered in crumbs. Most likely out walking my yellow Labrador Daisy! Great write up Kate! Sorry your pies went 0-3 for openers, but what a cracker contest. Last 5 mins of the 3rd had 18,500 on the edge of their seats – they were off them after Nina kicked the winning point until the last wave of Collingwood attack was vanquished! Sorry you guys but the Adelaide v Footscray match made your game look second rate. The precision passing of both sides, the marking and handball was outstanding. Watched both games back to back and you could see the difference between the two teams not that the TV coverage was anything wonderful. The players from both sides were excellent considering the sweltering conditions. Cec McIntosh one of my favorites. Love how she goes about it and Razzle Brazill was terrific down back. Jamiee Lambert’s goal after being injured was sensational . A few questionable home town decisions didn’t help ! Bring on the Dees at Vic Park next Saturday ! This sure was a cracking game. Thanks, Kate. Terrific to have you on the Almanac site. 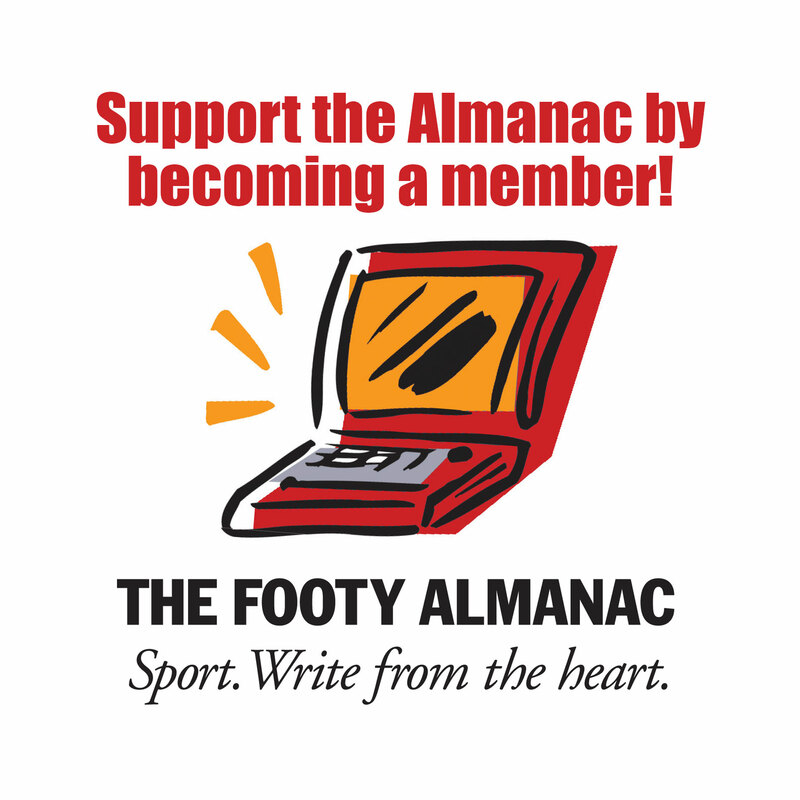 Lots of spark in your piece too – for supporters of both sides, and footy. It was great to see The Hoops run out. I liked how they tried to get the play on game happening with some good old-fashioned running past for the handball. That’s so characteristic of Geelong footy. 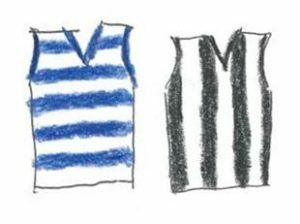 You never know how you are going to feel, but this was definitely a Geelong side for me – if you know what I mean. Looking forward to reading more as the season unfolds. Great work Kate. I was there and on the edge of my seat. Geelong just held on. Gotta feel for the Pies. Enjoyed the game immensely and thanks for your report. No luck for the Pies in these season openers. The trick now is not to turn one loss into the slow start of other seasons. Conference B looks pretty open, if you’re good enough. Thank you for all the positive and encouraging comments; as well as the warm welcome to the Alamanac team! Honestly; I agree the quality did get better with each passing game – can’t say I paid much attention to Crows VS Dogs as I watched it at 2am when I should’ve been asleep! Fingers crossed for an even more interesting football weekend this Saturday; looking forward to trekking to Victoria Park!